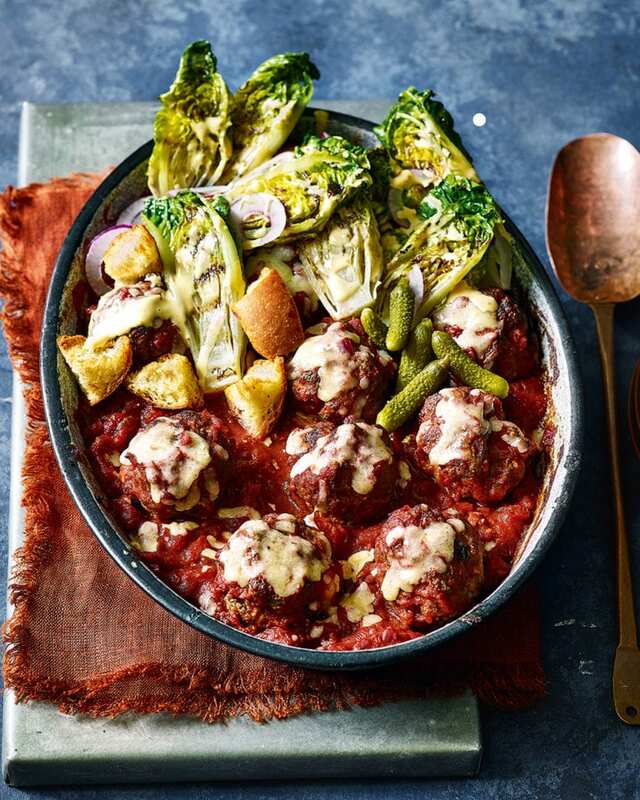 We’ve combined two of your favourite comfort foods into one epic dish; say hello to cheeseburger meatballs. If you prefer, leave out the salad and brioche croutons and serve the meatballs over spaghetti instead for an easy midweek meal. Either way, this is a real crowdpleaser. Heat a splash of oil in a large frying pan over a medium heat. Cook the chopped onion for 6-7 minutes to soften. Put half in a mixing bowl and set aside to cool. Once the onion in the bowl has cooled slightly, add both minces, paprika, parsley and seasoning. Use your hands to scrunch and mix the mince to combine, then divide into 12 equal-size balls. Push a cube of mozzarella into the middle of each meatball, then arrange on a baking tray (or a couple of plates) and chill in the fridge to firm up. Meanwhile, make the meatball sauce. Add the garlic to the pan with the onion and fry for a minute more, then add the wine, vinegar and tomatoes. Season well with salt, freshly ground black pepper and a pinch of sugar. Bring to a fast simmer and cook for 20 minutes over a low heat until thickened. Heat the oven to 220°C/200°C fan/gas 7. Heat a frying pan with a glug of oil then, in batches, cook the meatballs, turning, until browned all over. Transfer the meatballs to the tomato sauce and cook for a further 8 minutes, turning, until cooked through. Halve the brioche buns, then cut into chunks. Put on a baking tray, drizzle with a little oil and season. Bake for 5 minutes or until toasted. Top the meatballs with the grated cheese and put in the hot oven for a few minutes to melt the cheese. Heat a griddle pan over a high heat until hot. Drizzle the lettuce with a little oil, then griddle, cut-side down, until charred. Turn and cook on the other side until charred. Mix the burger sauce dressing ingredients together in a small bowl. Arrange the grilled lettuce on a platter and top with the gherkins and drained red onions, then drizzle over the burger sauce dressing. Scatter the brioche chunks over the meatballs, then serve with the salad and let everyone dig in. Make to the end of step 4, then cool, cover tightly and freeze for up to 3 months. Defrost in the fridge overnight, then reheat until piping hot and complete the recipe to serve.